Help Us Help Others | Donate Now ! The Mood Disorders Society of Canada believes that consumers, families and caregivers are entitled to clear, accurate information about mood disorders and other mental illnesses. Informing yourself about your own or a loved one’s illness is an essential step in the journey to recovery. The following documents have been developed to provide you with straightforward facts and tips. Feel free to share them with others. People casually use the phrase, “I’m so depressed” to let others know that they are feeling down. But a temporary case of the blues – something we all experience – has nothing to do with real depression.True depression is not the blues, sadness or even grief. It is an overwhelming and enveloping despair so bleak and dark that people who have experienced it say that it is the worst pain they have ever endured. Depression is a treatable mental illness. 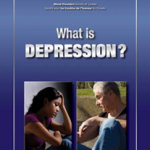 Eight percent of Canadians will experience a major depression in their lifetime. Young people are particularly affected with 20% experiencing an episode of depression before the age of 20. Read more… (PDF English / French). This brochure is based on comprehensive research so you can trust the information it provides. This extended plain text version offers all references. Read more… (PDF English).